Every now and then you see a kitchen that makes your heart beat a little faster. Surprisingly, what makes these spaces so memorable is often a single calculated design element — in an otherwise well-designed space, of course. Here are 15 details pulled from our Kitchen of the Week series that make each kitchen hard to forget. 1. Lounge-style banquette. 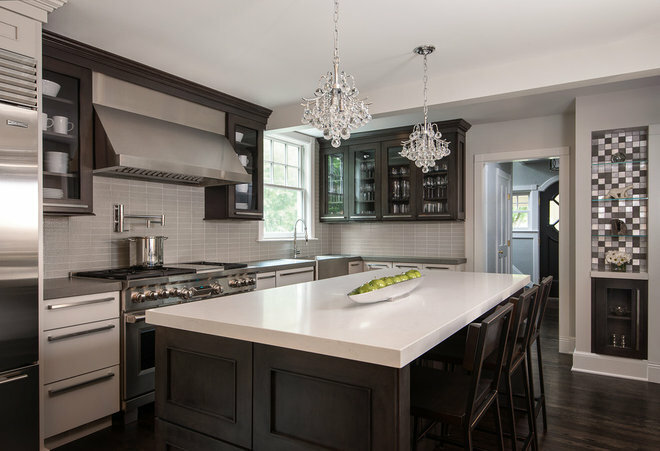 Architect Ben Awes did away with a formal dining room to triple the size of this kitchen and add a generous lounge-style white leather banquette smack dab in the middle to accommodate large family gatherings. The banquette surrounds a graphic granite slab table. 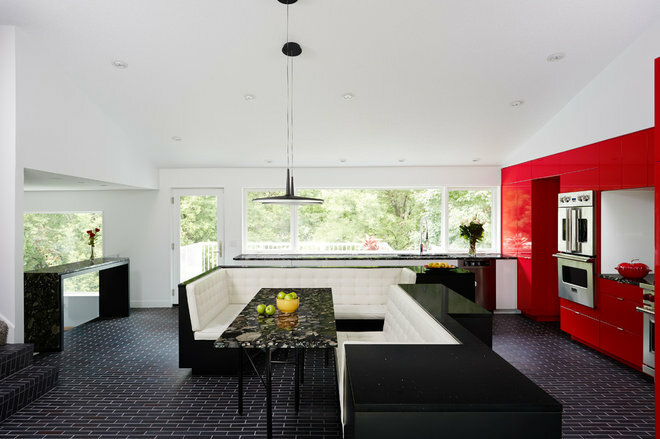 The back of the seating forms a black quartz island work surface with cabinets below. 2. Multipurpose table on wheels. Not crazy about having a full-time dining table taking up floor space, Richard and Linnaea Bursch in Portland, Oregon, tapped designer Pangaea to come up with a better solution. She delivered with a table on wheels that can be tucked under the large island to create a breakfast bar, and rolled out to accommodate more formal occasions when needed. 3. Colored island plus colored fridge. 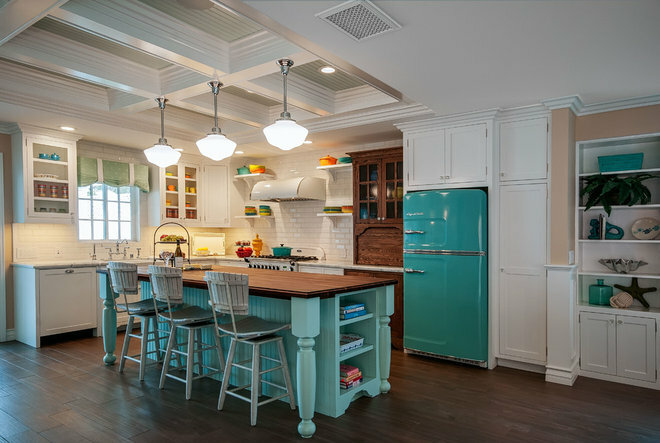 A coordinating vintage-style turquoise fridge and aqua island (Rolling Waves by Dunn-Edwards) strikes the perfect beach bungalow tone in this California kitchen. 4. Wallpaper. Most homeowners wouldn’t dream of putting wallpaper in a kitchen for fear of food splatters and grease ruining it. But as long as you’re not using wallpaper as a backsplash (if you do, make sure it’s covered by glass), it can make for a great feature wall, as shown here in a Texas kitchen. 5. Intimacy in a cavernous space. Faced with sky-high ceilings, designer Vanessa Weeks created a copper ceiling section above the island to provide a more intimate feeling. 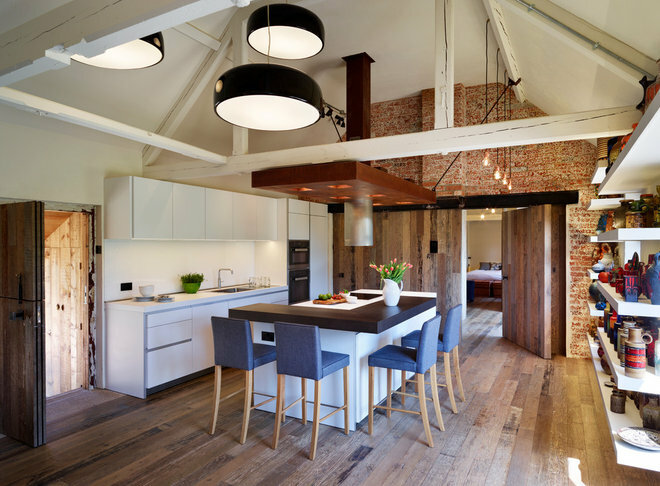 Three oversized industrial-style pendents also help fill the void and make a strong design impact. 6. Pewter countertop. 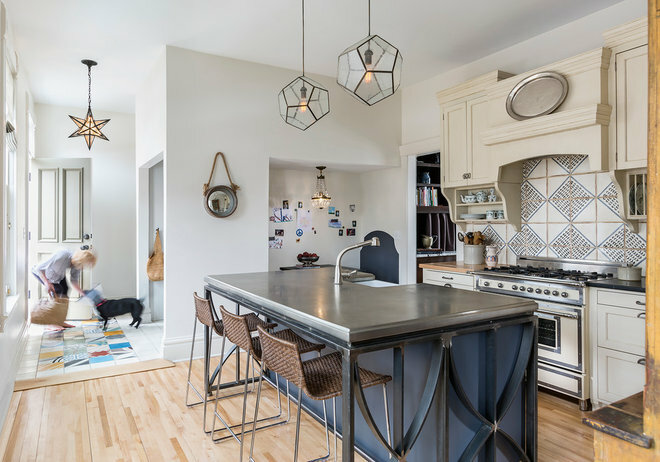 While there’s a lot to love in this Minnesota kitchen, the lead-free pewter countertop on the iron-encased island is sure to be the conversation-starter during any gathering. 7. Exposed ceiling. 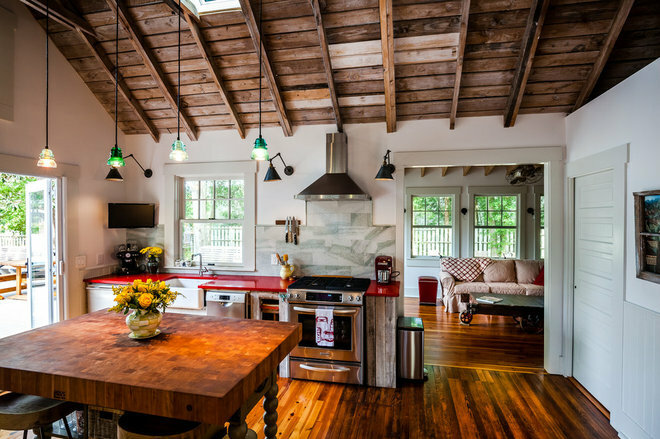 Removing a low ceiling revealed raw wood rafters in this North Carolina kitchen, an element the homeowners were all too happy to embrace rather than cover up. 8. Cheery cabinet color. As a base camp for weekend skiing, hiking and biking in the Rocky Mountains, this home needed to exude a fun vibe. 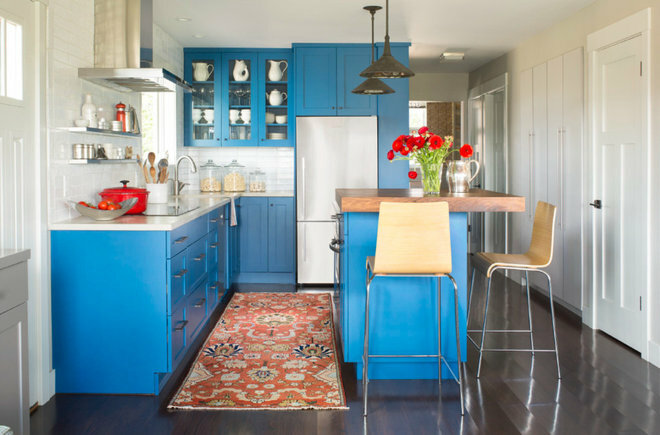 Enter a bold blue paint color for the kitchen cabinetry. Imagine these cabinets in a traditional white or wood tone — not something that would get burned into your memory. 9. 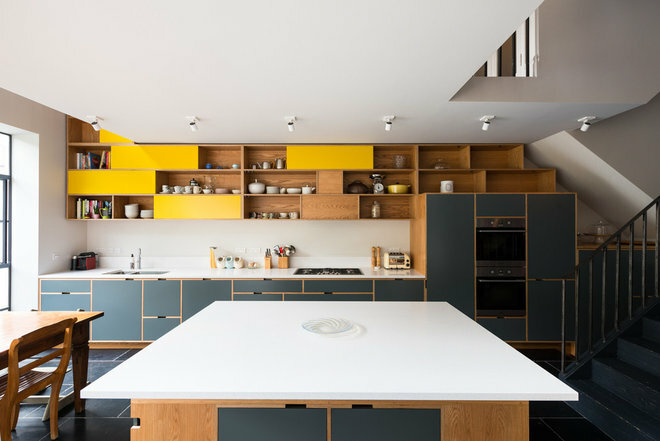 Two-tone cabinet color scheme. 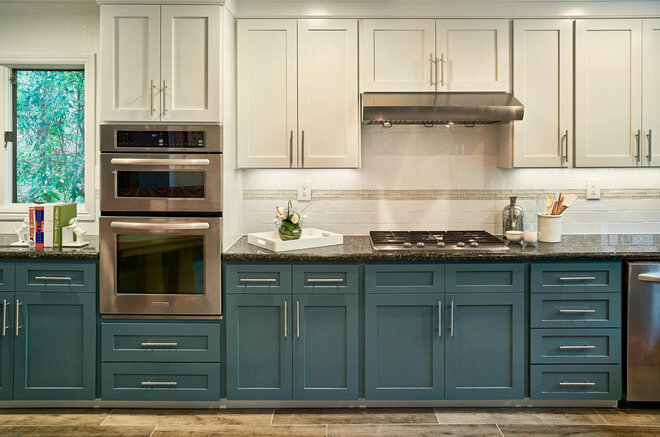 We’ve reported how two-tone cabinets are destined for stardom this year, and this California kitchen is a good example of why. Originally the homeowners wanted an all-white Shaker kitchen before their designer, Sabrina Alfin, advised against it for fear of its coming off as too sterile. 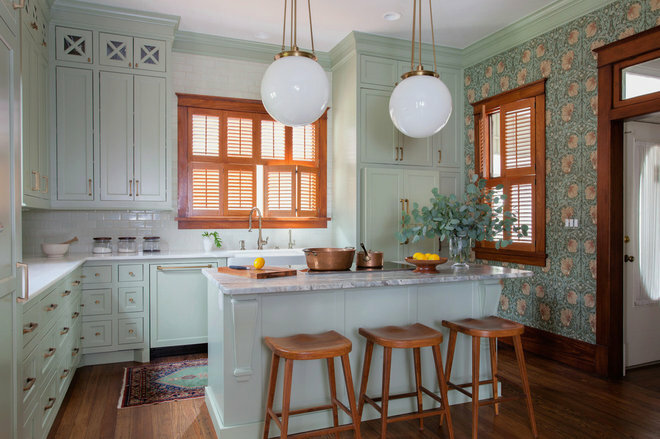 A grayish-teal color on the lower cabinets brought just the right balance and sophistication. 10. Hexagonal tile backsplash. 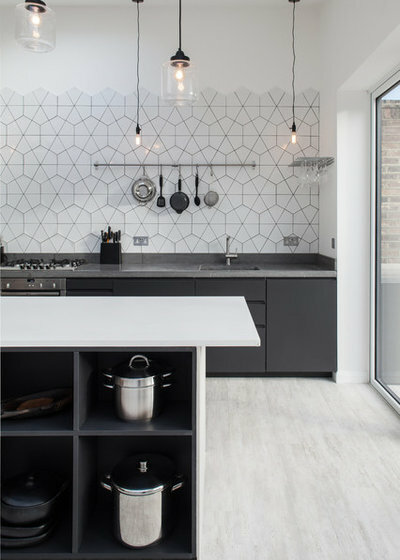 One look at these hex tiles and you’ll wonder why squares and rectangles have dominated backsplash tile choices for so long. 11. Craftsman-style cabinets. Few things can beat the look and feel of fine woodwork. Here, cabinetmaker Jon Frost created gorgeous red birch cabinetry with furniture-style feet. 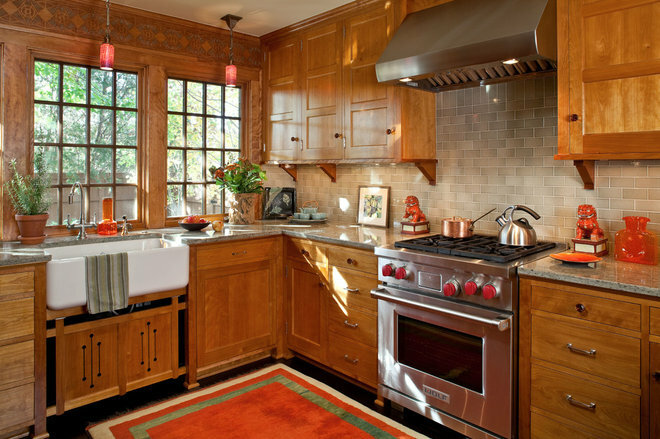 Amber glass knobs and Arts and Crafts-era stenciling above the window make this one unforgettable kitchen. 12. Custom cabinet wall system. Coming up with a way to make the most of the awkward kitchen in this split-level home proved challenging for architect Melissa Robinson. 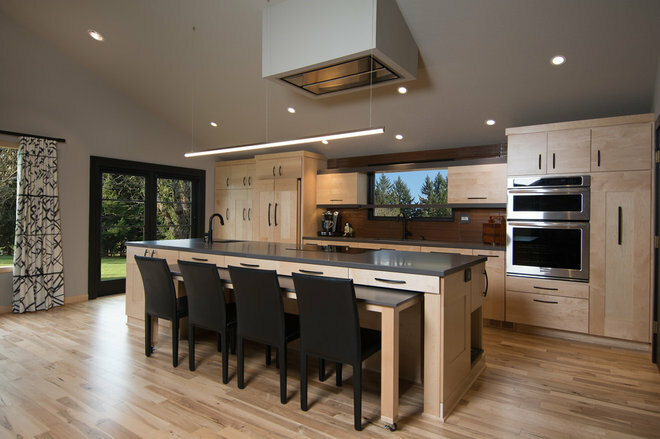 Her solution was to partner with kitchen design company Uncommon Projects to create a massive piece of cabinetry with units that span three levels of the home, from the basement to the kitchen and up into the study. 13. Chandeliers. Designer Christine Ramaekers and the owners of this Michigan home smartly steered away from going with typical shade pendents over the island. Instead, a pair of crystal chandeliers add just the right touch of sparkle to complete the space. “If we chose something too simple, the kitchen would just fade away,” Ramaekers says. 14. Under-the-range storage drawers. 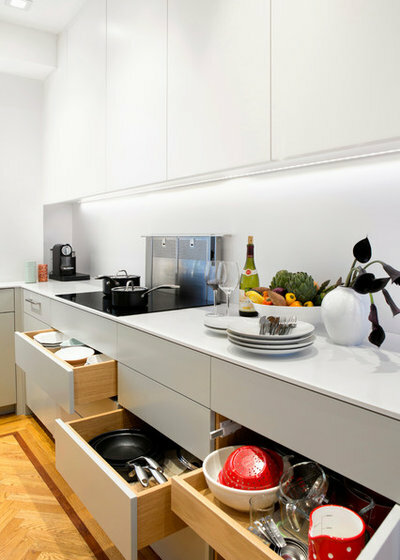 In this 110-square-foot New York City kitchen, storage is everything. A sleek induction cooktop frees up space below for deep drawers for everyday dishes. 15. Antique butcher block island. 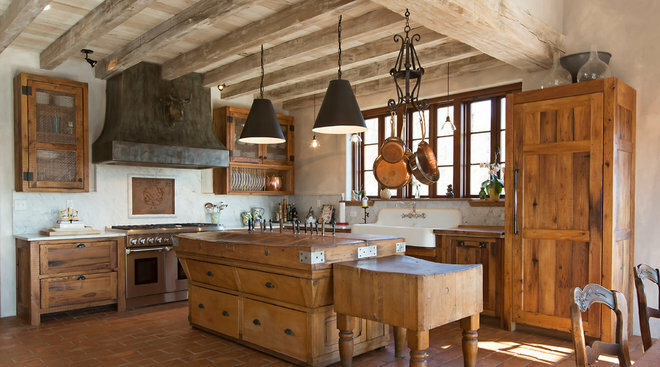 It’s likely that anyone who’s ever stepped foot in this Pennsylvania kitchen has never forgotten it, thanks to the early-1800s French butcher block from a butcher shop used as an island. The 8-inch-thick top has deep dips from years of hammering meat in the butcher shop. Now that’s a conversation-starter. Copyright © 2019 Northern Plumbing Supply. All rights reserved.